Thursday, February 27 1908 -- Before government regulation did much to smooth the terribly bumpy road of the economy, financial panics were relatively common occurrences, happening on average about every seven years. One of the effects of these panics was often a localized shortage of government currency due to hoarding. When currency became scarce, banks and other institutions sometimes printed their own temporary currencies, commonly called scrip. In the Panic of 1907, the Los Angeles Clearing House Association, one of those institutions, had to issue scrip. Today they burn all the cancelled scrip paper, satisfied that the panic is over and it won't be needed again, at least for awhile. 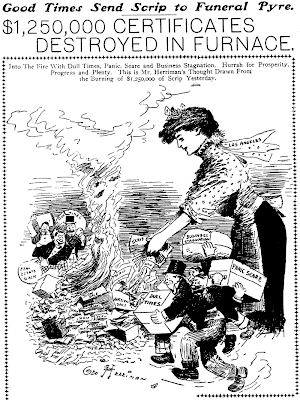 Herriman cartoons the scene when huge piles of scrip were fed into the furnace of the Llewelyn Iron Works. Certain factions in the country today, mainly those with no knowledge of history, shout endlessly about the need for smaller and less intrusive government, and for allowing the free market to fly forward unheeded by government regulation. Financial panics at the rate of one or two per decade are one of the features of the 'good old days' before government interference. Is this what we're supposed to be nostalgic for? Harry Paul "Hal" Forrest was born in Philadelphia, Pennsylvania on July 22, 1892, according to his World War I draft card. The California Death Index at Ancestry.com said his birth year was 1893, and a Spokesman-Review (Spokane, Washington), August 30, 1935 profile, said the birth year was 1895. In the 1900 U.S. Federal Census, he was the youngest of three children born to William and Annie. They lived in Philadelphia, Pennsylvania at 1912 Sterner Street. The census said he was born "July 1892". His father was an insurance agent. Ten years later, the Forrests were in Philadelphia at 3501 Water Street. It's not clear what his occupation was. The Spokesman-Review said, "From 1911 to 1915 Forrest attended the Art Institute of Chicago. He became a member of the art staff of the Chicago Tribune and then joined troop A, First Illinois cavalry. During 1915 to 1917 he was a member of the headquarters troop, third New Jersey in infantry…." He signed his World War I draft card in April 1917. His home address was in Clementon, New Jersey. His occupation was student at Fort Myers Camp in Fort Myers, Virginia. He was described as tall, medium build, with brown eyes and dark hair. He has not been found in the 1920 census. His father, a widower, lived in Clementon, New Jersey. The Nevada State Journal published Forrest's United Press International obituary, on November 26, 1959, which said, "…[Forrest was] an editor of the Culver City, Calif., News in the early 20s…." In the late 1920s, he created Artie the Ace, the forerunner to Tailspin Tommy. The Aberdeen American News (South Dakota) said on November 25, 1959, "…in 1952…Tailspin Tommy…became the basis for a television series, a radio program and several books…." 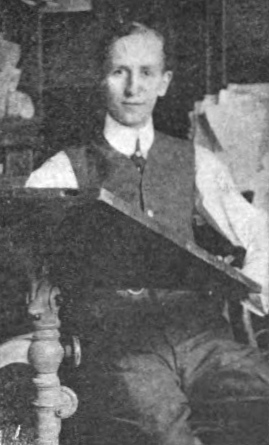 According to an otherwise pretty reliable sounding website about Tailspin Tommy and its creator, Forrest's first pro work was at the Philadelphia Telegraph in 1911, a strip called Percy the Boy Scout. I haven't indexed the 1911 Telegraph, but I'm a bit skeptical of that claim, especially since the author says next "he collaborated with Lee Pape, author of Little Benny's Notebook, on a Sunday page of colored comics in the Philadelphia Record." This was supposedly sometime in 1915-17, but that paper I have indexed and I say it didn't happen. There is, however, Willie, which wasn't mentioned. Our "Little Willie," or rather William John Steinigans is the sport of the class. In one sense he is always well informed as to the occurrences in the athletic world; on the other hand his sportive wit and grotesque actions causes much mirth and (trouble.) Willie, "Let not thy mirth turn to mischief," so goes the proverb. On one occasion Willie was asked why he did not recite. He replied "I hain't got no book." At other times he would often answer "Because." In the 1900 census, he was the youngest of two children born to John and Emily, both German emigrants. They lived in Meriden, Connecticut at 880 Broad Street. His father was a knife maker. Steinigans birth date was "Feb 1879" and his occupation was "Type Writer". He was listed as a clerk in the Meriden, Connecticut, City Directory, 1901. The date of his move to New York City is not known. He was on the staff of the New York World which published his strip, The Dream That Made Bill a Better Boy, starting in August 1905. 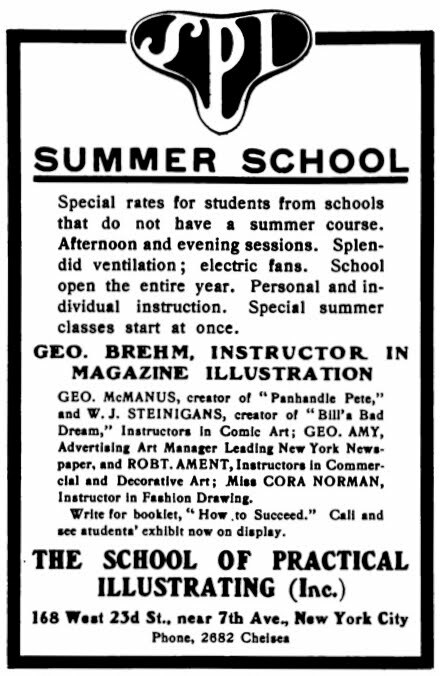 He and George McManus were instructors, in comic art, at the School of Practical Illustrating; an advertisement for its summer school appeared in International Studio, May 1907. 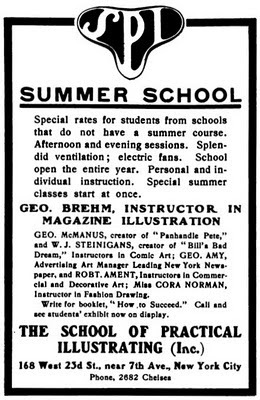 And he instructed at the National School of Art, 2228 Broadway, according to an advertisement in the New York Herald, January 12, 1908. He and Vet Anderson handled the evening comics and cartooning class. …[George] McManus, who boasted that they kept him on the World, his first New York paper, because Joseph Pulitzer, who was then blind, could not see his drawings; Tom Powers, whose cartoons and barblike quips will be remembered by thousands; Bill Steinigans, who drew dog pictures for the World; and I were the four horsemen of Park Row. We rode, for the most part, in search of drink, food, and pleasure and invariably found them all. The little group was broken up in more ways than one when doctors presented Steinie with an ultimatum which gave him a year to live in New York or three years in the West. Steinie elected to go to Banning, in Southern California. Although he lived for five years, it seems to me that he would have been much happier with a shorter stay on this earth spent in New York. In Banning and later in Tucson, Arizona, he was among strangers, people who were not his kind, with nothing to see but cacti and desert. Steinigans also spent time in Palm Springs, about twenty-two miles southeast of Banning. The Riverside Enterprise (California) named him and others in its February 8, 1920 article, "Palm Springs Has Lure for Tourists". …Lovely indeed is the Palm Springs of today—and yet this some pilgrim cannot but regret the passing of the picturesque, ramshackle little collection of huts and shacks beloved by the colony of former days, which included Edwin Salisbury Field; Mrs. Robert Louis Stevenson, wife of the famous author; Robert V. Carr, another writer; "Jimmie" Swinnerton, well known Hearst cartoonist; George Herriman, creator of "Dinny Dingbat" and "Krazy Kat"; William Steinigans, New York World comic man; and others noted for their creative talents. He was in Tucson in 1917. At Ancestry.com, the U.S. IRS Tax Assessment List 1917 recorded his name for the 1916 tax year. He was in Tucson when he filed his 1040 form and owed twelve dollars. His wife put an ad in the Tucson Daily Citizen on March 27, 1917. Lost—Mexican poodle dog. Color, yellow and white, spotted, long hair, weighs between 5 and 6 pounds. Answers to the name Japeno. Liberal reward if returned to Mrs. Wm. J. Steinigans, Santa Rita St. Box 114. 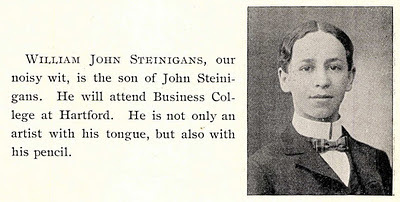 Steinigans passed away January 25, 1918, in Los Angeles. Cartoons Magazine, in its March 1918 issue, gave a brief account of his life. William J. Steinigans, comic artist on the staff of the Sunday World, died at Los Angeles, Cal., Friday, January 25. Mr. Steinigans was a member of the World staff for about sixteen years, most of that time on the Sunday comic supplement. He was the creator of "The Bad Dream That Made Bill a Better Boy," "Splinters," "Mr. Hubby" and other comic series. He was famous particularly for his funny pictures of dogs, which figured in every series that he drew. About five years ago, Mr. Steinigans went to California for his health, and with the exception of some time spent in Arizona, he remained there until the end. He is survived by a widow. The Daily Citizen printed a series of legal notices, regarding Steinigans' will. In the superior court of Pima county, state of Arizona. In the matter of the estate of William J. Steinigans, deceased. Notice is hereby given that Southern Arizona Bank and Trust company, a corporation, has filed in this court a certain document purporting to be the last will and testament of William J. Steinigans together with his petition praying that said document be admitted to probate in this court as the last will and testament of said William J. Steingans who, said petitioner alleges, is deceased, and that letters testamentary issue thereon to said petitioner, and that same be heard on Tuesday the 26th day of March, A.D., 1918, at 9:30 o'clock in the forenoon of said day, at the court room of said court, in the court house, in the city of Tucson, county of Pima, state of Arizona, and all persons interested in said estate are notified then and there to appear and show cause, if any they have, why the prayer of said petitioner shoal not be granted. By M.S. Brown, Deputy Clerk. First pub, Mar. 15, 1918. Last pub, Mar. 27, 1918. In the matter of the estate of William J. Steinigans. Notice is hereby given by the undersigned executor of the estate of William J. Steinigans deceased, to the creditors of and all persons having claims against the said deceased, to exhibit such claims, with the necessary vouchers, within them months after the first publication of this notice to the said executor, 36 North Stone Avenue, which said place the undersign selects as its place of business in all matters connected with said estate of William J. Steingians. Southern Arizona Bank & Trust Company. Executor of the Estate of William J. Steinigans. According to the Connecticut, Deaths and Burials Index at Ancestry.com, Steinigans was born in 1879, and buried at the Walnut Grove Cemetery in Meriden, Connecticut. Steinigans was in Los Angeles when he died. The address of where he lived, at the time, is not known but there are two possibilities to consider. His wife was recorded in the Los Angeles City Directory, 1920 at "1321 N Serrano", and in the 1920 census at 1404 Serrano Avenue. William Steinigans was a workhorse in the bullpen of the New York World for over a decade (not the Herald as you'll see reported on various websites). 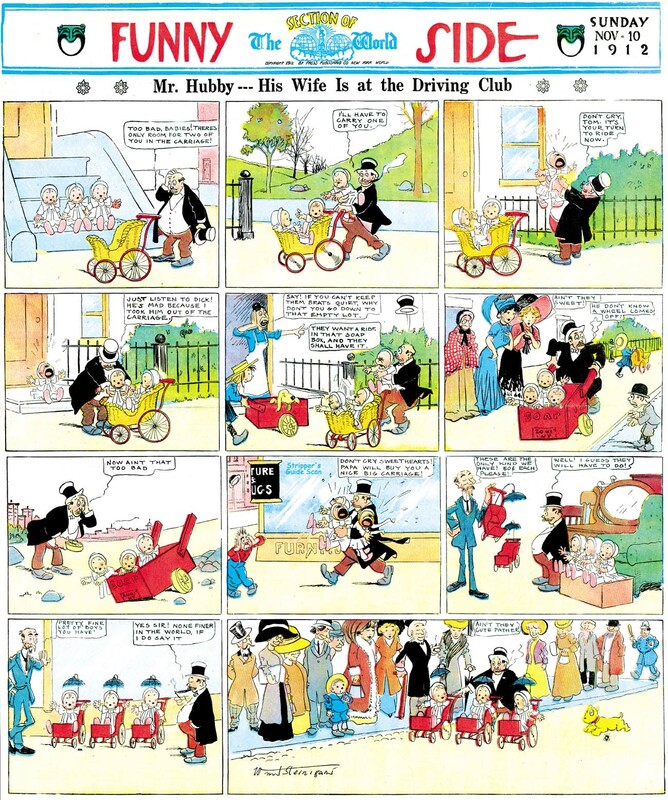 Although his name isn't remembered except by diehard cartooning buffs, his style was very familiar to the average New Yorker in the the 1900s and 10s. He had an affinity for dog strips, but was adept at humans as well. Mister Hubby was his last new strip creation for the World, and also the last to end. It started on September 1 1912 and ended December 17 1916. 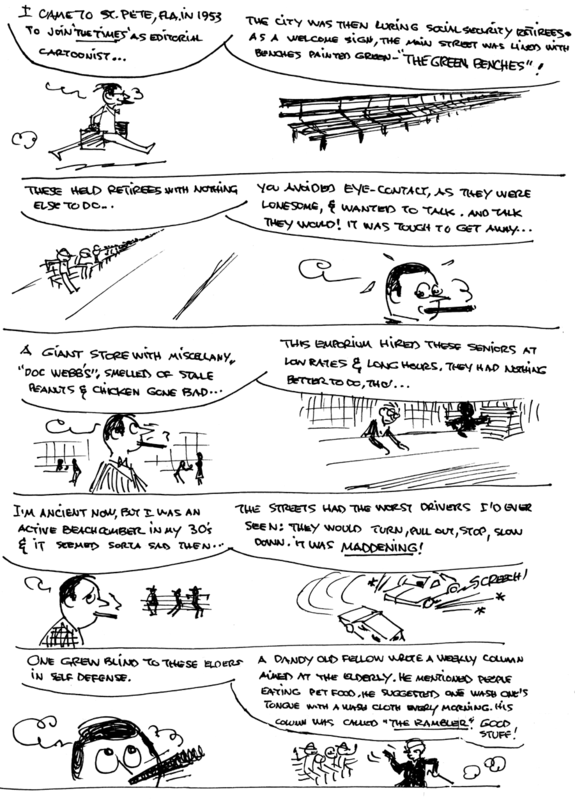 It is not a fitting coda for Steinigans, who obviously preferred penning his dog strips. In fact Mister Hubby is quite bland, to the point where the title couldn't be much more generic. According to reports on the web, Steinigans died in 1918 at the age of forty, less than a year after Mister Hubby ended. Tom Toles is one of the leading lights in editorial cartooning and has a Pulitzer to prove it. And that's only about a half-dozen Pulitzers short of what he deserves, in my humble opinion. Back in the 1990s, when he was still with the Buffalo News but had already gained national fame he took the plunge and created a comic strip. This is no great surprise, as it seems most every editorial cartoonist of any note gives it a go at one time or another. 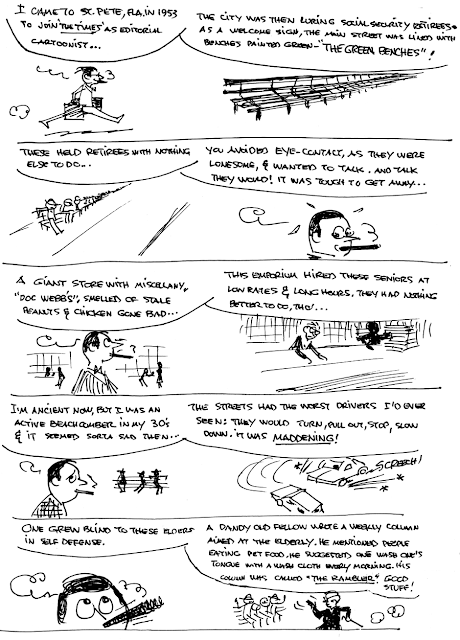 Tom Toles' Curious Avenue, distributed by Universal Press Syndicate, debuted on April 19 1992 to a lukewarm reception. I'm betting that feature editors who liked Toles' political cartoons grabbed the strip on reputation alone, while others wouldn't touch it with a ten foot pole. The strip, however, was completely apolitical. It featured a cast of rather goofy tykes who sport a host of neuroses. They generally act like kids, but they can express themselves like adults. So yeah, somewhat like Peanuts, but with an edgier and overtly darker sensibility. The strip tended to be a bit on the violent side, with physical encounters between the kids a pretty commonplace occurrence, and sarcasm was as rampant in the strip as in Toles' editorial cartoons. I found the strip intriguing and the drawing style attractive. I rather liked it, although I did feel it suffered for a lack of likeable characters . Apparently I was in the minority for liking the strip because it went belly-up in less than two years; the latest I've found it running is December 31 1994. I imagine Toles pulled the plug, seeing that it wasn't going to be a major income-producer. If the samples intrigue you, look for an Andrews-McMeel reprint collection of the strip issued in 1993; it's on the scarce side, but not particularly expensive. I have about a year of tearsheets from them, which I will show at my blog at some point. I like Toles, but I was mostly disappointed graphically. after about ten, they all start to feel the same. I was a much bigger fan of Jack Ohman's venture into comic strip land. I've always wondered about the strip. Thanks for reproducing some samples! I loved this strip as a kid. I still have about 200 strips I saved throughout it's run. I'm hoping to track down a complete set someday. The characters each had unique voices and there was a serialized element that kept me reading. I enjoyed the recurring character, Bill, a child Bill Clinton that Toles would infuse with political satire. Isn't the passage of time crazy? Jim writes of going to St. Pete in the 50's and I wasn't even born then. Jim was in his 30's then... and now 30 seems young or at least youngish. LOL. Keep the stories coming, Jim... you old Rambler, you.